I've been gearing up to spawn in a week or two's time. But, we enjoyed more sun this weekend than I expected which pushed water temps up to 20 degrees in the polytunnel. I've only just completed treatments for costia and flukes in all the tanks so the fish have had it tough the last few weeks - but the treatments are over, and I estimated spawning was possible and decided to run a kohaku set. I put the oyagoi together on the Saturday afternoon - usually I like to get them in the vat by around 3pm but there was a lot to do and I was late. It was 6.15pm before I had the whole thing set up and the oyagoi in place. This is one of the cage nets I purchased last autumn, to help with fry selections. It's 1.15m x 2m x 0.75m. Water depth in the pic is 30cm. I ran two males to the one female. This is the female I spawned last autumn in a late spawning, and the fry were fast growers The males include a new one that Mike Snaden sourced for me over the winter (2013/14) specifically for my project - the other male and the female are also from him. Woke up early this morning in anticipation, but no signs of spawning at all. In fact, the koi looked bored. The water temp first thing in the morning was 17 degrees. By late morning the temperature was pushing towards 20 degrees. I popped back several times during the morning and reflected over a cup of tea at 11.30am, to consider options. At 12:30 I went back out intending to perform a 50% water change and to re-arrange the spawning ropes; but I was amazed to see spawning was underway. Spawning appeared over at 2.30pm so I moved all three oyagoi into the males tank - and it turned out there were still a few eggs to come out, which the males sorted out. The total quantity of eggs judging by eye was more than last autumn but not as many as my more prolific females. I don't know whether the fact I used this female in a later spawning last autumn meant she had less time to develop a large set of eggs, or whether she just doesnt produce that many. I guess time will tell on that one, and with her spawned early in the year and a full 12 months before her next spawning, we will see next year whether the egg quantity is higher. This was my first spawning attempt using a cage net - I want to test whether keeping the males and females closer together would improve fertilisation rates. 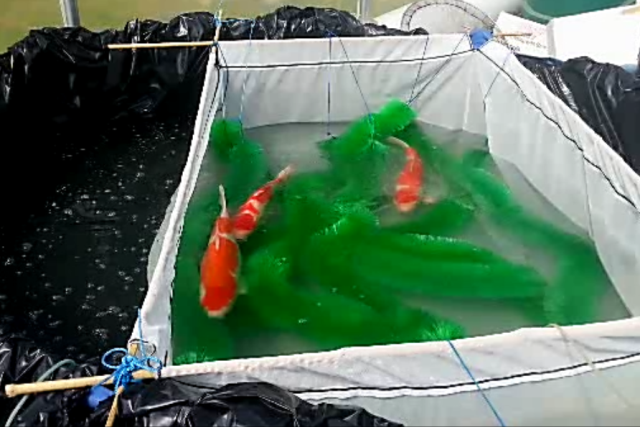 Also, when I run the showa sets I want to be able to perform kuroku on the hatchlings - ie to separate out the black fry from the white fry and keep just the black ones. To make that easier - my thinking is that if the spawning happens within the cage net, then perhaps the eggs and hatchlings will also be contained and make life easier when I need to catch the fry. Well, so far so good. the eggs are mostly within the cage net. I'll know tomorrow afternoon about fertilisation rates and later this week about how well the net holds the hatchlings. 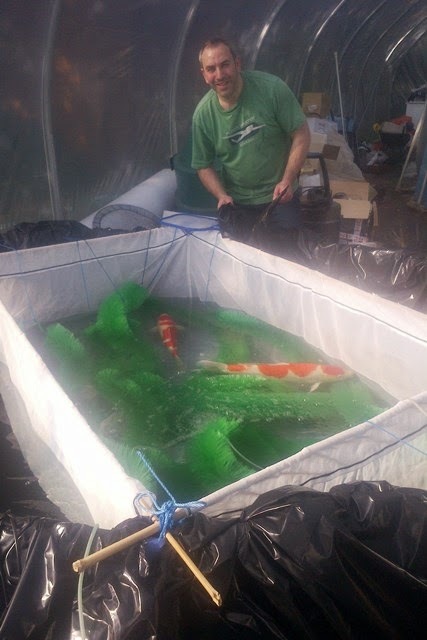 The fry ponds outside are not quite ready, and with mixed weather due this week I am not counting on them being ready for the kohaku fry. When the fry are ready to go out (all being well! ), I'll review the situation and they will either go into a fry pond outside or I will use them for my first attempt at rearing hatchlings indoors in a re-circulation pond. It feels great to have got this year off to a decent start, and I'll provide more updates as the eggs develop through the week.